Toady was my surgery day. 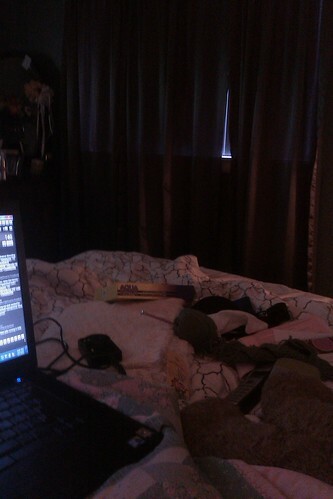 I'm writing to you from my bed, propped up against my new headboard (post on that tomorrow) with my foot elevated and just about everything I need around me. Last week my laptop decided to crap out on me. It doesn't want to charge itself all the time & I can only get it to kind of charge when it's turned off. Of all weeks for it to crap out on me. Luckily it's still under warranty so Dell will fix it as soon as I send it in. Today started bright and early at 6:30. 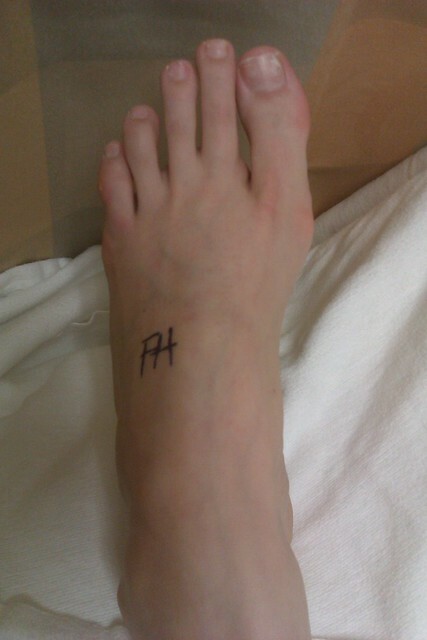 I had to sign my foot so they knew which was the right one to operate on. I almost put a smiley face on it. My Dr. came and talked with me for a bit. We hadn't talked about anaesthesia previously and he talked about two different options. One was where I get a local and they do give me a sedative, but you can wake up during surgery. 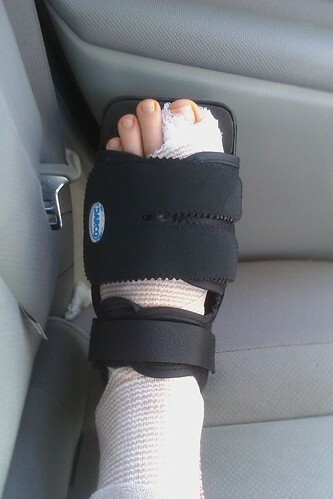 He said that I'd have a tourniquet on my ankle and that usually if that happens the person tries to move their foot. Yeah. Waking up during surgery did not sound fun so I went with a general where I was completely put under. The anaesthesiologist came by a little while later. Seriously, the guy kind of freaked me out. He had on this weird old man sweater with the buttons seriously bulging. John said he sounded Romanian or something and has been doing impressions of him all day. He kind of seemed like he'd been dipping into the anaesthesia or something. He just said that if I did general I'd have a sore throat, which actually hasn't been bad. I had a tiny bit of one when I woke up, but that's it. I don't remember what time they took me back. Maybe sometime around 8 or a little after? All I remember is the anaesthesiologist putting the mask on me and asking me to count from 100. I got to 97 or so and said something to my nurse that my arm was hurting. I have no idea what they were doing to it (they had taken my glasses by then and I couldn't see), but it really hurt. Next thing I knew it was 8:40 and I was being rolled into Recovery. I'm assuming I woke up pretty quickly since I remember that part. I just remember being a little confused and actually shed a couple of tears and then was suddenly totally fine. 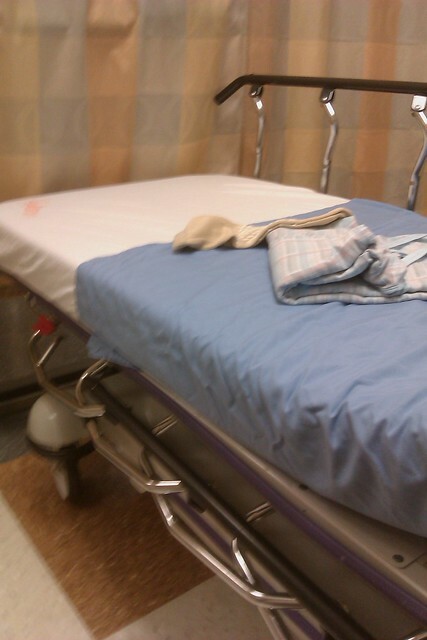 I was there for about 30-40 minutes before they moved me and John was able to come back. An hour after I went to Recovery I was on my way home! I think my toes look like sausages (I have skinny toes if you didn't notice in the second picture). I haven't really had any pain. My toes get a little tingly every now and then. My toe itches a bit where I'm guessing my sutures are. I'm taking my pain meds all day today and will probably do so tomorrow and just gauge where my pain is from there. I can walk on my heel a bit so I can get to the bathroom. Anything more I'd have to put my surgical shoe one. Which I'm SO GLAD is not bright blue like I expected. I got back in on Friday to see the Dr and find out how I'm doing. For now I'm doing good. I'm all set up with everything I need. 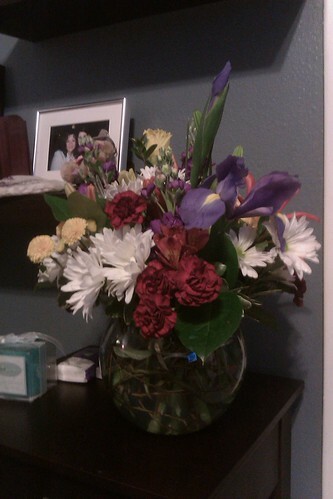 Plus work and my MIL brought me flowers! I'm glad everything went well! I cry hysterically from anesthesia every time...it makes people do wacky things! aw glad you're not in pain! Feel better soon! Now you'll have young woman toe back! 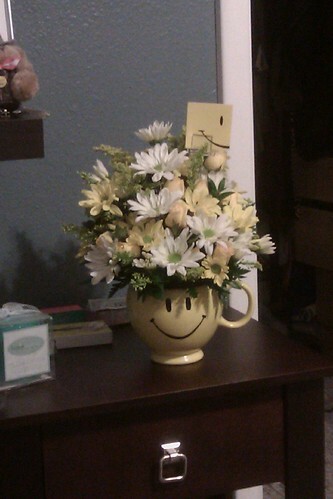 Glad you're doing well! Hope you heal quickly!